The gift-giving season is in full swing, and I know you feel the stress of finding the right gift for the special people in your life. I’m sure I’m not the only one who feels exhausted at the thought of having to find the perfect gift that will let those you love know you appreciate them and are in tune with the things they love? If you could only read their minds, right? I certainly wish people could read my mind! Which is why I had so much fun coming up with this list. I just wanted to keep adding to it. 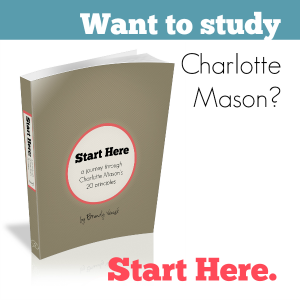 Charlotte Mason homeschool moms are a peculiar breed, with peculiar tastes. We don’t want to just journal, we want a beautiful Common Book. Why settle for painting, when you can dry brush? I’m sure you’ve noticed we love books, but not just any book will do. They must be living books, whatever that means. And for the love of everything that is good in this world, never buy the abridged version. Now, I can’t promise you that every Charlotte Mason-inspired homeschooler will want everything I included below, but I can assure you they will tug at her CM-heartstrings. I’m sure I did because there are so may things out there that appeal to my CM mama heart, so leave a comment and let me know what else you’d add to the list! 🙂 A few moms use something similar to display their nature walk finds. It’s really cute! Thanks for stopping by! Bookshelves!! How could I have forgotten bookshelves. And I totally agree about the pens. 🙂 Thanks for stopping by! Thank you Paola. Merry Christmas!